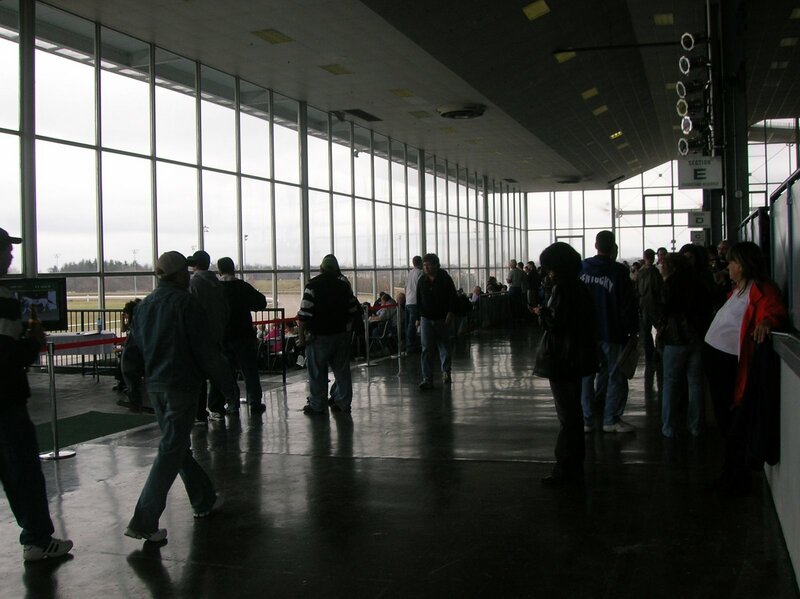 If you’re a big fan of Turfway, you may want to stop reading. I have never liked going to a track for the first time on a big racing day, and my experience at Turfway on the day of the Lane’s End bears out that instinct. I am sure that it’s a perfectly fine track, and given my deep affection for Aqueduct, I bring no snob appeal mentality. Nonetheless, I probably had less fun at Turfway than I’ve ever had at a day at the races. A friend to whom I was talking about this piece exhorted me not to be too hard on the place, insisting that we need to cherish and support the small racetrack. I couldn’t agree more, and I’m sure that on a different day, under different conditions, I’d have had a wonderful day. There is much to praise about the place; I just wish that I’d been in a better position to enjoy its advantages. While there are lots of frivolous ways in which I spend money, I refuse to pay ATM fees unless absolutely necessary; I avoid tolls if at all possible; and I won’t pay people to park my car for me. This last stance meant that I parked a half mile away from the entrance in a large field; I envisioned a long, slow crawl to the exit following the races, remembering the hour I spent getting out of Keeneland last spring, but, resisting the $5 valet parking fee, park in the field I did, and trudged to the entrance. When I knew that I’d be in Lexington over Lane’s End weekend, I called Turfway to reserve a table. Normally, I’m not a reserved table sort of person; I like to find a spot outside or at the bar, but given my unfamiliarity with the place and the running of a major race, I didn’t want to risk being one of those people who shows up at 11 am on Travers Day and wonders why there’s nowhere to sit. So I called and I booked: $45 per person in the Homestretch Restaurant, which entitled me to a TV at my table, a view of the track, and a buffet. The Homestretch Restaurant is on the ground floor of the clubhouse; on this day, it was overcrowded, hot, and claustrophobic. Low ceilings and a buffet table set up in the middle of the room didn’t help, and my view of the track was essentially from a few strides before the wire to the finish line. The only real way to watch the race was on the television, as there is no infield screen. 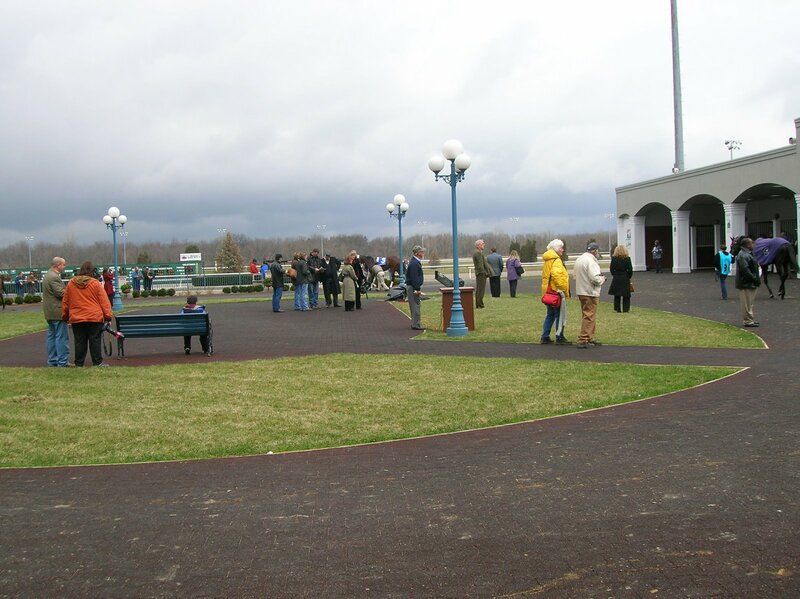 If you sit outside (which no one in her right mind would have done on this day…it was literally freezing), you see nothing until the horses come to the top of the stretch. If you sit where I did, you see the last two seconds of the race. The buffet was fine: salad, potatoes, bread, chicken, beef. You’re out of luck if you’re a vegetarian or if you happen to have given up meat products for Lent (a rare demographic, I know, but one into which I happened to fall on this day before Easter), but the roast beef was tantalizing rare and juicy. Our waitress Kristi was outstanding: professional, friendly, and completely on the ball. We lucked out with our table; we could have been stranded in the middle of the room with people within fingers’ reach on all sides, but our table was tucked into a corner at the far end of the dining room. Some would have considered it Siberia; I considered it heaven. The Homestretch Restaurant does have its own bathrooms and betting windows (both human and automated), and, unlike the rest of the ground floor, was non-smoking. I couldn’t help comparing the package to that which is offered at Equestris on Aqueduct on big racing days; for $40, you get a buffet; a table with a TV at which you can bet if you have a NYRA card; betting machines and windows; and a magnificent view of the track from your top floor clubhouse perch. The two simply don’t compare. We walked upstairs to check out the second and third floors; stadium seating dominates the second floor, with an excellent view of the track and loads of light, both of which the first floor lacks. Above is another small dining room and concession stands, none of which I checked out in much detail. There are other dining areas on the fourth/fifth floors—seats there were $85, and I never did make it up there…the place was packed and moving around wasn’t easy, so I gave up and retreated back to my tucked-away table downstairs. 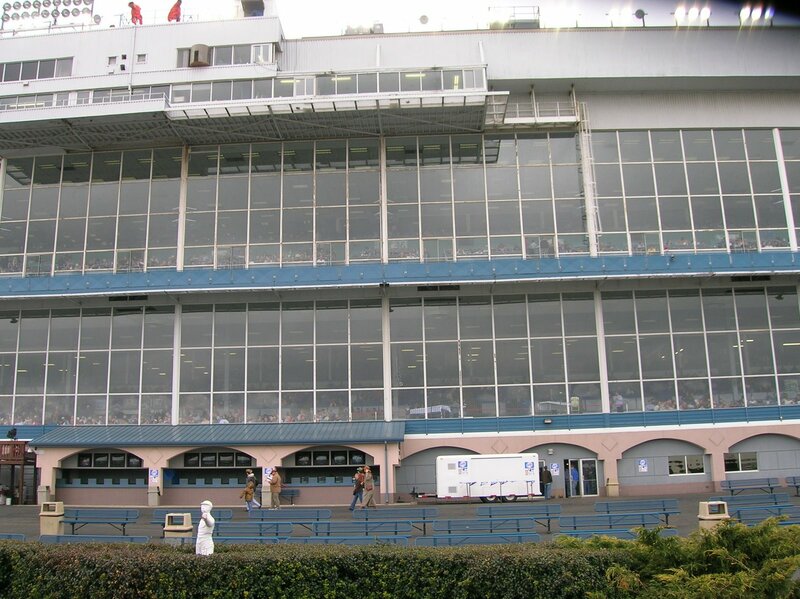 Clearly, those upper floors were the place to be, with panoramic views of the races, seating, and dining rooms. I’d imagine that the place would be totally different on a beautiful day; it was too cold and wet to spend much time outside, so everyone was inside, resulting in cramped, uncomfortable conditions. The paddock felt a little industrial, but I suppose that’s the way with winter racetracks; no one could call the Aqueduct paddock anything but serviceable. And check out that sky! Speaking of the paddock, I at one point noticed that a number of the horses had intricate mane styling, braids and ribbons and all kinds of accoutrements that made me feel a little embarrassed for the horses. Flipping through the program, I came across an ad for “The Best Turned Out Award,” to be given to “the groom whose horse is most professionally presented for each of today’s five stakes races.” What a GREAT idea to recognize the work of the people who toil in anonymity; I’m not sure that I love the idea of encouraging the grooms to dress up the horses, but I am sorry that I never found out who won the awards. The program was itself smartly turned out: full color throughout, on glossy paper, full of information for both the seasoned and the novice bettor. Unfortunately, this little gem set me back $4.50. $4.50! The program at the Breeders’ Cup doesn’t cost that, nor does the program for the Belmont or the Travers. I bought two Turfway programs and one simulcast program and forked over $12 for the privilege of doing so. Outrageous. Even more so when, returning to our table after visiting the paddock, one of those pricy papers had been pilfered. Nice. 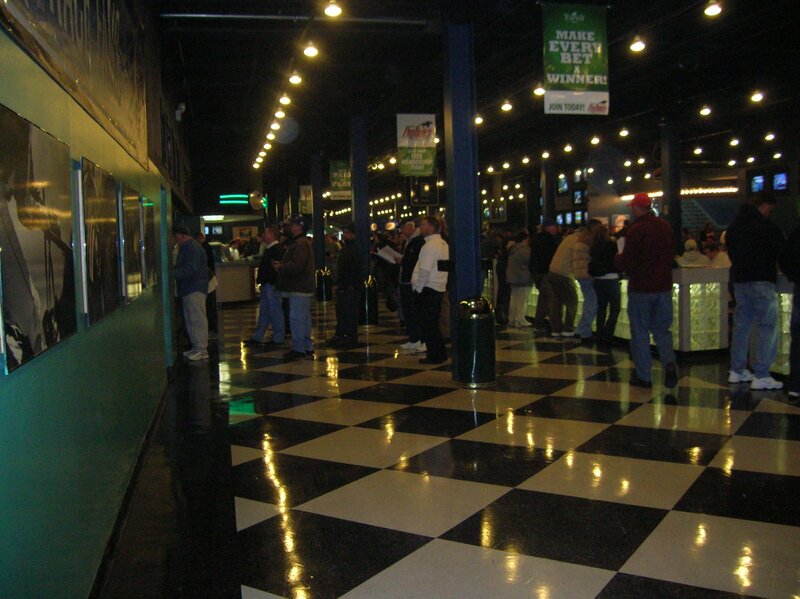 I wanted to like Turfway, I really did, and I’d like to go back on a non-stakes day. I imagine that it’s pleasant in the way that smaller tracks generally are, and it would be great to walk around without fighting crowds. The track management did much to try to accommodate a large crowd on an awful day, and every track employee with whom I interacted was unfailingly pleasant and friendly. 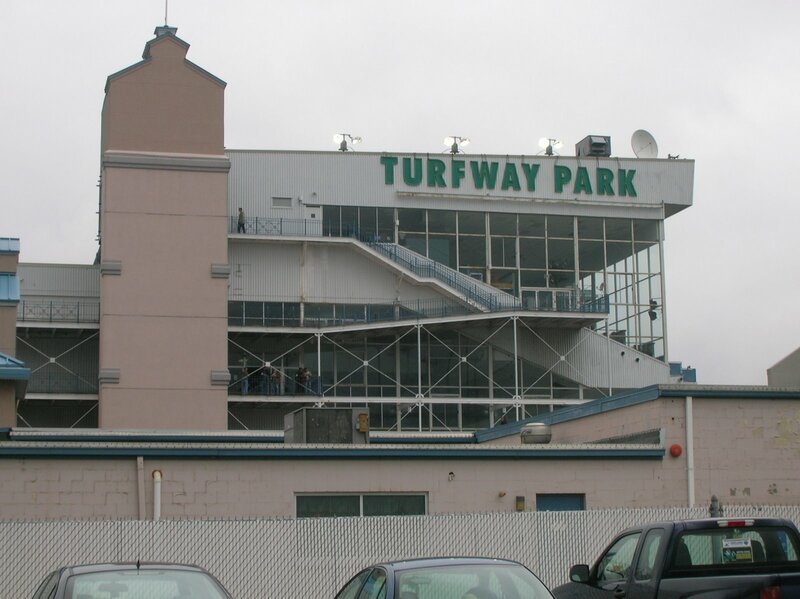 You can read here about Turfway’s interesting history, and in fact, the whole website is terrific, including as it does a photo gallery of various elements of the racetrack. Now I’m going to be really curious what you think of Colonial Downs. DON’T come visit on Colonial Cup day or VA Derby Day, LOL.It’s crowded and the traffic is horrific. But you don’t have to pay to park and you get a good view from the Jockey Club room. They’ve obviously decided to make more money out of the day. 2 years ago we paid $40 for a buffet upstairs and seats-and they certainly hadn’t got round to producing a ripoff racecard!-but it is cheaper than than the 07 Breeders’ Cup racecards (and so it should be!) for both Friday and Saturday-my guess is $10 for both days within 2 years. Lanes End Day sounds like every day at Keeneland! Except we do have days when the weather is beautiful which only brings out more people you have to contend with – lol. Everyone at work likes to go to the Equestrian Room for lunch and the afternoon but you can’t see a single horse except on the monitors. I think it’s rather bizarre to go to a racetrack and not watch the actual races but as we all know Keeneland is a world all of it’s own! I have to say I disagree with Lindava about Colonial. Virginia Derby day is one of my favorites. It is a day that reminds me of the Kentucky Derby (well-dressed southern big shots “high rolling” in the fancy upstairs rooms), the Haskell (families doing a picnic thing) mixed with the young beer drinkers discovering they can go to the racetrack and have a great time. The joint is jumping, and in a good way. And while the I-64 traffic on the way down from d.c. should only be inflicted on the people who are bound for an eternity in hell, anyway, the trip out and back at the end of the night is always whiz-bang (hopefully more whiz than bang), with the sunroof open and thoughts of great turf horses still in my head. Don’t worry about the bite of the Brooklyn Backstretch, Lindava, I think she’ll love it down there. — J.S. Linda, I will leave it to you as my host to decide (calendars permitting) when we make the big foray to Colonial Downs. You know that I’m dying to go…and if you think going on the big days is a bad idea, I defer to your excellent judgment. And if I go on a big day and it’s awful, I will hold you, J.S., personally responsible. The way I see it, Colonial Downs must respond to this challenge, not I. – J.S. Oh my! What a responsibility. I’ll have to check the calendar. Honestly I’ve never been on a big day, so I’ve only heard rumors about the traffic problems. Usually on VA Derby day it is too d@mn hot for me! I prefer the comfort of my air conditioned house especially since last year it was actually on TV and with Laffitt Pincay III for some extra eye candy! ;)J.S I was thing more about her reaction to the “look” of the place. To me the grandstand looks gorgeous from the outside (the view from I64) but inside has a slightly “industrial” look to it. I’m a “local” and I don’t go to Turfway much, even on normal days when admission and parking are free. On Lane’s End day they jack the price up on anything, taking advantage of their customers, of course. You don’t see Keeneland doing that on Bluegrass Day.Next time you’re out this way, and it’s summer come over to River Downs. Although it’s a small track, it’s a pretty place to watch the races. Right on the river, literally. The dining room is reasonable, and I highly recommend the popcorn and ice cream. Turfway is the worse race track in Kentucky by far. It should be bulldozed. Absolute pig sty.